You’ve seen football… You’ve seen tennis… But have you seen Comedy as a sport? ComedySportz is the all ages, all action, all improvised competitive comedy show that sees two teams battle it out for laughs with quick-witted gags, games, sketches and songs inspired by your suggestions. There’s a referee on hand to ensure a good clean match – it’s a family friendly show after all – with penalties for bad behaviour and bad jokes. Who wins? You decide! ComedySportz have been delighting audiences across the UK with shows and workshops for all ages since 2001. A proud member of the CSz Worldwide family. 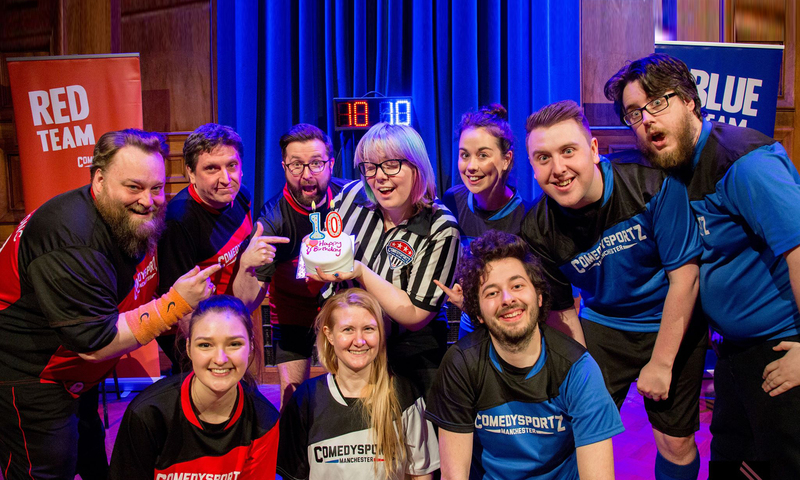 ComedySportz - All Action, All Improvised Competitive Comedy! Regular Workshops and Courses. Next intake Early 2019. A hit with adults and kids alike! Another successful run at Edinburgh Fringe 2018! Bespoke workshops and shows for schools and businesses. ComedySportz Improvised Pantomime Returns December 2018! Shortform and Longform Improv Shows! Comedy in collaboration with Salford University. Private Hire for Events and Parties. ComedySportz 4 Tots - BIG laughs for little kids! Comedy as sport. Not about sports! We deliver regular workshops in Improvisation and Stand Up comedy as well as shorter courses and workshops that cover areas such as clowning, sketch writing and longform improvisation. You can find more information about our regular courses on our Workshops page. We are Manchester’s longest running regular Improv course. Workshops are fun, friendly and, most importantly, affordable. Our next term starts 16th February 2019. Sign up now! We also provide bespoke workshops and shows for education and corporate sectors. Improv has much to teach us about life with many fantastic transferable skills to help you, your team or your class develop. If your school or company is looking to improve skills for collaborative and devised work, to promote team building and confidence or simply to reward hard work by playing harder, don’t hesitate to get in touch for more info to see how ComedySportz can help with our bespoke workshops designed to accommodate any budget. We also provide flexible corporate entertainment packages, combining training days with a show to improve staff team work, performance and business communication. Intensive Workshops – Don’t Miss Out!